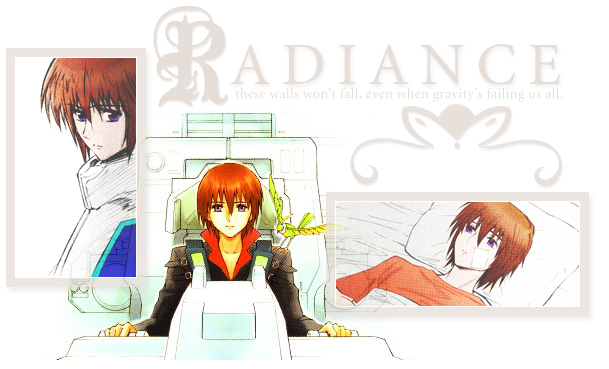 Kira and Athrun were best friends as kids. They were reunited when Athrun took part in a raid on the supposedly neutral ORB colony Heliopolis, where Kira was an engineering student. Since Athrun was a ZAFT soldier and Kira had little choice but to take on the role of an Earth Alliance soldier, they became enemies by default. Athrun, dreading the fact that he may have no choice but to shoot down his former best friend, tried to persuade Kira to come over to ZAFT when they met in battle. He did not understand why Kira, a coordinator like himself, had sided with the naturals of the EA and not with his own people. But Kira didn't take him up on his offer because he had friends on Archangel that he wanted to protect. Despite all this, Kira still kept the pet mechanical bird Athrun made for him before he left for PLANT, Torii [Birdy in the dub], as a reminder of the close friendship they used to have. After meeting up with Lacus in episode 36, Athrun was compelled to reconsider who his real enemies were. He was under the assumption that Kira had died when he had clamped Aegis onto Strike and then self-destructed, making his own escape. Lacus informed him that Kira was indeed still alive, and that she had entrusted Freedom to him. Athrun then took Justice to Earth and was finally reunited with him; for the rest of the series, they were on the same side (which was neither EA or ZAFT - their goal is to end the fighting between them). In SEED Destiny, they opposed each other for a short time while Athrun was persuaded to join with ZAFT again, but it had nowhere near the level of tension between them that lasted for the majority of the first series.. The relationship between Kira and Lacus is kind of hard to describe, because although it's very popular in Japan and stressed pretty strongly in images, it actually wasn't given much development in the first series at all. There is a lot of evidence that Lacus loves Kira, but with the Fllay ordeal and all the other psychological trauma that's dumped on Kira by the end of the series it's hard to tell how he feels about her. The most significant way to describe their relationship is that Lacus is like his healer. Most of the scenes with the two of them in the series involve Lacus comforting him in some way, or even letting him stay at her house until his wounds heal. What goes on between Kira and Fllay is very complicated. Fllay seems relatively neutral towards him until she finds out the reason he can pilot Strike is because he's a coordinator. She has a strong hatred for coordinators - one that is deepened even further when ZAFT attacks the shuttle her father is in, killing him. She becomes very angry that Kira didn't end up saving him, and makes up her mind that the only way she'll ever be satisfied is if Kira, too, is killed in battle. So she begins to manipulate him into believing she likes him; she kisses him, takes up the typical girlfriend role, and eventually sleeps with him (all of this despite the fact that she is technically engaged to Ssigh, who is also on Archangel). She asserts that he'll protect her, though deep down what she really wants is for him to die. Although Kira doesn't really ever seem all that into the relationship (the closest he came to being aggressive about it would probably be when he got on Ssigh's case in the desert arc), he doesn't seem to grasp the fact that she's manipulating him for a while either. They part on a bad note before Kira goes out to what would be his last (and worst) battle with Athrun. She talks to Ssigh and tells him she never really had feelings for Kira, but he casts her aside because he doesn't seem to care anymore. After the battle, when Kira is announced as being MIA and probably dead, Fllay seems satisfied - that is what she'd been hoping for after all, and yet she seems to be troubled by something. A few episodes later she is kidnapped by Klueze, who becomes like a new father-figure to her, and she is forced to be in constant company of the people she hated - coordinators. Over the course of her time with ZAFT, she comes to realize she was wrong and is later given a Neutron Jammer Canceller by Klueze and sent away in an escape pod. Kira tries to rescue her but fails, and she ends up in the Dominion, where she confesses to Natarle that she knows she was wrong. When Dominion is in battle with Archangel, Natarle sends Fllay and the rest of the crew to an escape pod while she holds off Azrael. Unfortunately, while Kira comes very close to rescuing them this time, the pod is hit by one of Providence's (piloted by Klueze) funnels and explodes. What happens next is very hard to explain, because it isn't very clear what exactly happened. Fllay's ghost appears in front of Kira, telling him what she didn't get a chance to say while she was still alive. She says that her true feelings will protect him, then disappears. It was said in a director interview that the point of that scene was "what Fllay wanted to tell him", so it's assumed that her ghost didn't literally appear before him and talk to him. Unfortunately that makes it harder for Kira to bear responsibility for her death. Kira meets Cagalli in the first episode, but then she doesn't reappear until later in the series. At that point they have no idea, but near the end it's revealed that Kira and Cagalli are actually twins. It's never said who the older one is, but Athrun and Cagalli have a playful argument in one of the last episodes in which he assumes she's the younger, but Cagalli insists she's the older one. They have a very close relationship and are quite protective of each other. Ssigh and Kira are normal friends until the incident with Kira and Fllay. Because Fllay and Ssigh were engaged through their parents, Ssigh is a little jealous of Kira, though he never does show much affection towards Fllay himself. They have kind of a tense friendship for a while, but they seem to be on better terms when the Archangel meets back up with him later on. Mwu seems to understand what Kira is going through while he's on Archangel more than anyone else, as he's the only other one who can protect the ship. He's the one who encourages him to do whatever he has the power to do, so he had a big impact on Kira's decision to keep fighting. Shinn and Kira are enemies from the beginning of SEED Destiny. Shinn's family was killed in a battle on Orb, and he clearly remembered seeing Freedom there. So it wasn't so much that his enemy was Kira; his enemy was whoever was piloting Freedom, and of course that happened to be Kira. It is Shinn who eventually destroys Freedom in a fierce battle between the two of them, which leaves him elated. Of course, Kira ended up surviving, leading them to remain enemies until the very end. In the Final Plus version of the last episode of SEED Destiny, they meet at a memorial on Orb. Kira reaches out to him, asking him to help rebuild. Shinn knows he is Freedom's pilot, but still takes his hand. When the series ends, they have become allies.